It has become a tradition for many photographers to publish their favorite photos of the year. I embrace this tradition because it helps me review my photography for the year and also is a good way to introduce new images to my followers. I have included some background information for each image below as well as why it was chosen. These images are published in chronological order so the order is not any indication of my preference for a particular image. I hope you enjoy viewing them as much as I enjoyed shooting them! It is rare for the Seattle area to have a large snow storm, but in February we had several inches accumulate. When I woke up to this winter wonderland, I decided to visit my favorite tree at the Seattle Arboretum. I named another image of this tree “Dancing Tree” so I decided to name this one “Dancing in the Snow”. It was a beautiful sight to see, but it did not last very long. The next day most of the snow had melted. 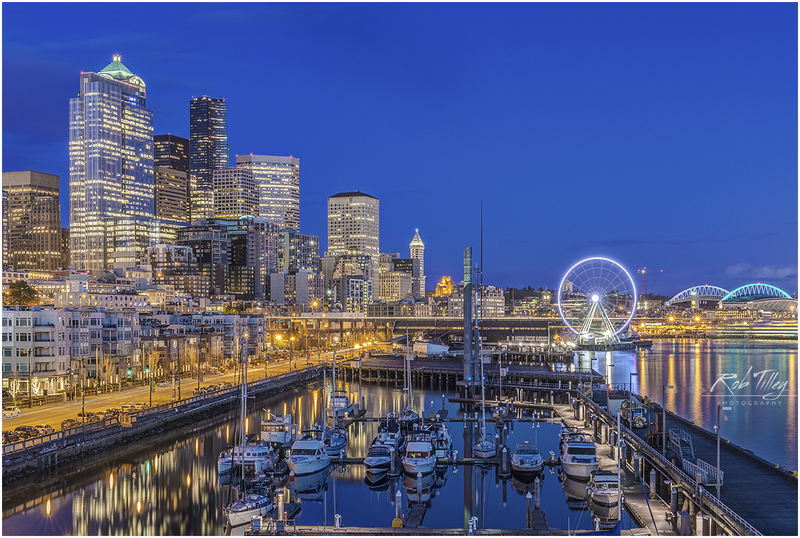 Seattle can be a bit dreary in the wintertime so we like to travel to sunnier climates for a break. In March we visited Hawaii and the weather was great. We stayed with a friend in Honolulu for several nights and one day we visited Waimea Botanical Garden on the North Shore of Oahu. I love to photograph at botanical gardens because the plants are so well taken care of and you can often find very unusual species. This is a spider lily. I think it almost looks like an abstract painting. Mother Nature is such a wonderful artist! I like to shoot abstract images whenever the opportunity presents itself. One of my favorite places to find abstract images are marinas. While I was in Honolulu I spent an afternoon shooting at the Ala Moana Marina. This marina is near several high rise hotels which were reflected in the water with the yachts. The ripples in the water created some interesting abstract designs. In May and June we traveled to Scotland and England. Our first stop on this trip was Edinburgh, the capital of Scotland. One evening I walked up to the top of Calton Hill which has a wonderful view of the city. This was the view after sunset when the lights came on. In the distance you can see Edinburgh Castle on top of the hill and just to its right is the clock tower of the Balmoral Hotel. The monument in the foreground is a memorial to Dugald Stewart, a Scottish philosopher. After Edinburgh we spent several nights in Glasgow. One of the highlights of our trip there was a visit to the Glasgow Botanic Gardens. During the 19th century, Glasgow was a major ship building center and the second largest city in the UK. The botanic garden was founded during this period of prosperity and they built several large hot houses to display their extensive botanical collections. This image is looking up at the roof of Kibble Palace. The foliage visible around the roof are tree ferns imported from New Zealand. After Glasgow we drove up to the Inner Hebrides Islands and took a ferry to the Isle of Mull. At the far west of Mull is the Isle of Iona. This small island is called the cradle of Christianity in Great Britain because St. Columba first came here from Ireland in his quest to spread Christianity to Scotland in the 6th century. Iona is on the western edge of the Inner Hebrides and is physically very close to Ireland. 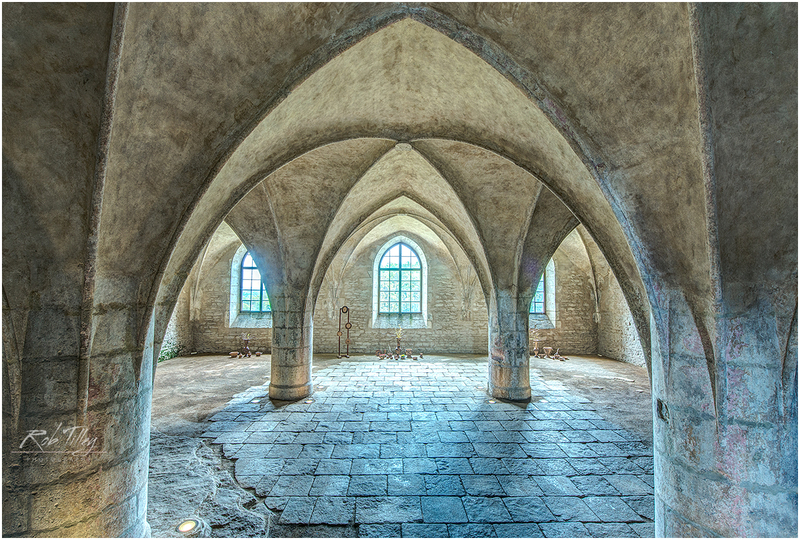 The monastery flourished from the 6th to the 9th centuries when it was attacked and pillaged by Viking raiders. In the 12th century, it once again became an important Christian center after the Vikings were banished, but was once again abandoned after the Scottish reformation. This current building was rebuilt in the 20th century, and while not ancient one can still feel the history of this place. On our trip to Scotland we ventured up to the Orkney Islands which are located above the northern tip of the Scottish Highlands. These are the Stones of Stenness which are thought to date back to 3100 BC in the neolithic age. While their original purpose is not known, scholars believe they were used as a ceremonial site similar to Stonehenge and most likely predate Stonehenge by several centuries. I thought it was interesting that sheep were allowed to graze near this very important archaeological site. I like the setting sun peeking through the clouds in this image. I am always looking for interesting abstract designs. This is lichen I found growing on a standing stone in the Ring of Brodgar on the Orkney Islands. These standing stones are more than 2,500 years old so one could wonder how old the lichen is. Perhaps the lichen is not very old, but it does make you wonder. I like this abstract design created by Mother Nature. After touring around Scotland I flew down to London and spent several nights in England’s capital. One evening I walked from Trafalgar Square down to London Bridge. This is a view of Whitehall from Trafalgar Square with Big Ben in the distance. I used a long shutter speed for this shot which created some motion blur of the bus in the foreground. I think this image captures the feeling of London. Whenever I am traveling I like to shoot iconic places because everyone recognizes them. This is Tower Bridge which is one of London’s most iconic scenes. Many people think this is London Bridge, but London Bridge is next to the Parliament Buildings. This bridge is called Tower Bridge because it is near the entrance to the Tower of England. I waited until well after sunset to capture the illuminated bridge against a dark blue twilight sky. I like the illumination along the river promenade as a frame. Autumn is always a great time for photography. When the colors were at their peak I visited Kubota Japanese Garden in Seattle. These are some autumn leaves I found there. I like the selective focus of this shot. The leaves in the foreground are so sharp you can see every water drop, but the background is pleasantly out of focus. I am a big fan of trees and I found a wonderful one at Kubota Garden this year. I decided to name this image “Reaching For Heaven” because it looks like it is doing just that. 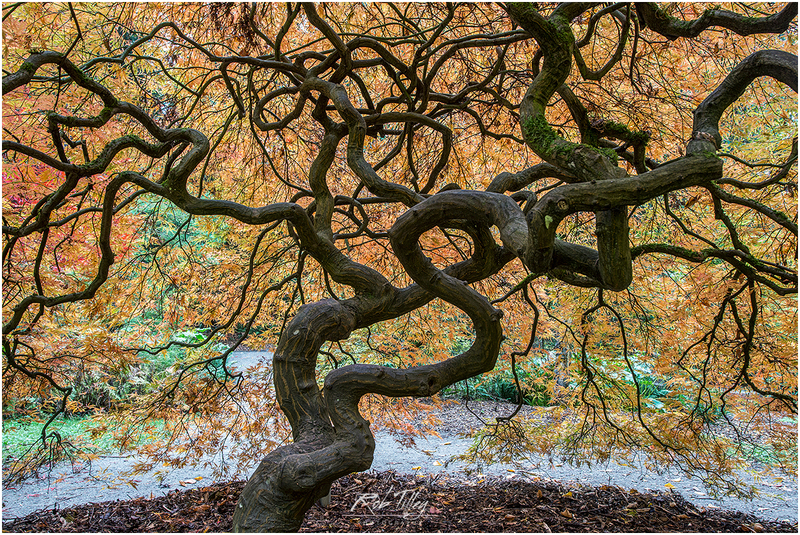 I just love these twisted branches with the autumn foliage and the pond in the background. Happy New Year! Wishing you the Best in 2018. I hope our paths may cross! It has become a tradition for many photographers to publish their favorite photos of the year. I embrace this tradition because it helps me review my photography for the year and also is a good way to introduce new images to my followers. I have included some background information for each image below as well as why it was chosen. These images are published in chronological order so the order is not an indication of my preference for any particular image. I hope you enjoy viewing them as much as I enjoyed shooting them! We visited Florida in February. Our trip was planned primarily to see my relatives, but I was able to find some time to take a few photos. This first image is looking out to the ocean from a private dock on Captiva Island. Docks are a fascinating subject because they are literally a bridge between two different worlds, dry land and open water. It was a bit cloudy on this day which made the dawn light very blue. I like the moodiness of this image. I love to make abstract images using various techniques. Shooting close up and photographing reflections are 2 great ways to make abstract images and this shot combines both techniques. I like the graphical composition of this image. I love shooting the new green leaves in the springtime. The Japanese call this time of year “The Time of New Greenery”. This is a shot of a small waterfall at the Portland Japanese Garden. I used a slow shutter speed to make the falling water look silky. I like the contrast of the motion blurred water against the sharp, green leaves. I took a road trip down to California in April. My first stop was San Francisco so I decided to shoot the city skyline at twilight. This shot was taken from Yerba Buena Island which is conveniently located between Oakland and San Francisco and can be accessed from the San Francisco Oakland Bay Bridge. 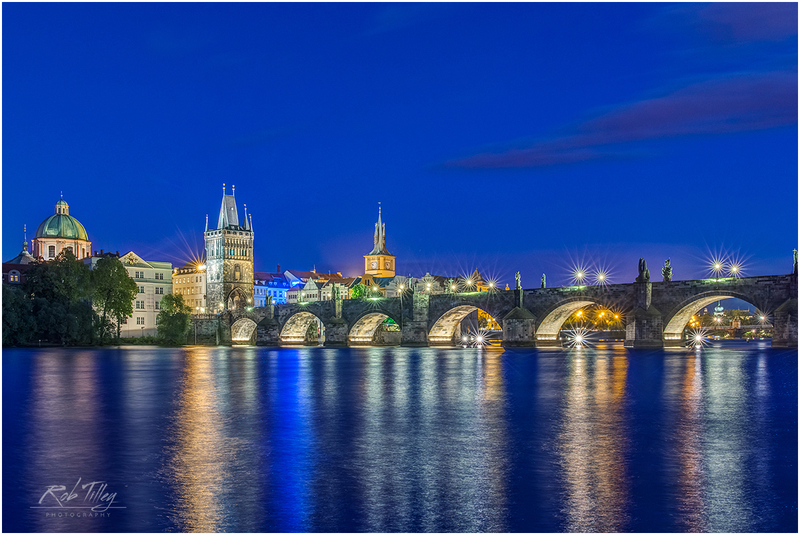 I like the illuminated bridge and buildings against this beautiful twilight sky. After Spending time in San Francisco I traveled up the coast of northern California. One night I stopped in Fort Bragg and visited Glass Beach. The city of Fort Bragg had a trash dumping sight next to the ocean and over the years many glass bottles and other objects were washed into the ocean. After many years these fragments of glass were eroded into smooth glass pebbles. The white and brown pebbles in this image are actually small pieces of glass that were eroded by the surf. I like the abstract design of real pebbles and glass pebbles in this image. In May we visited Italy starting in Rome. One morning I got up early to shoot Trevi Fountain during the blue hour. I love shooting at this time of day because there are so few people wondering around and everything is very quiet and beautiful. I like this very impressive monument with the twilight sky in the background. On our trip to Italy we spent some time in Naples. This is the Toledo Metro Station of the Naples subway. I am a big fan of modern architecture and when I saw a photo of this station I decided I had to go shoot it early in the morning. It was designed by a Spanish architectural firm along the themes of water and light. I like the surreal feeling of this ultra modern architecture. When we were in Naples we took a tour of the opera house. Naples was the birthplace of opera and Teatro di San Carlo is the oldest continuously active public opera house in the world. It was originally commissioned by King Charles and was completed in 1737. As you can see the royal box is very impressive and such a beautiful building! After Naples we flew to Palermo in Sicily. Palermo was the capital of the Norman kingdom of Sicily. This is a mosaic mural of Christ Pantocrator in the Palantine Chapel which was the royal chapel of the Norman kings of Sicily It was built in the 12th century. The Normans defeated the Arabs who ruled Sicily for over 200 years until 1061. Since Sicily was a crossroads of mariners in the medieval Mediterranean Sea, its culture is a mixture of Roman, Byzantine and Arab which is known as the Arab Norman style. The mosaic murals are truly amazing and were the highlight of our trip to Palermo. When we were in Palermo we joined a tour of the opera house, Teatro Massimo. Since Palermo is the largest city in Sicily and was its capital in the past, it has the most impressive opera house on the island. This is a view looking directly up at the ceiling. They just do not make buildings like this anymore! While I was in Sicily, I spent some time in Syracuse. In the 5th century BC Syracuse was the largest Greek city in the ancient world with a population larger than Athens. It was the home and birthplace of the famous mathematician Archimedes which is why this square is named Piazza Archimede. I like the movement of the water and the horse stature against this beautiful twilight sky. While I was in Sicily, I made a brief trip to Malta via the ferry. I had lunch in the small fishing village of Marsaxlokk and I fell in love with the design of the traditional fishing boats. 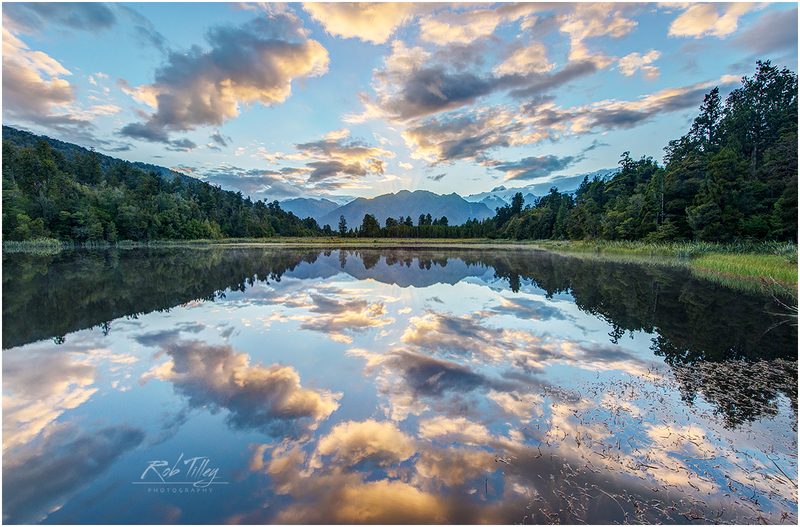 So I went back early the next morning to shoot the reflections in the early morning light. All of these boats have eyes painted on their bows to protect against storms and calamities at sea. I like the colorful, abstract composition of this image. After Malta, I spent a night in Ragusa. Ragusa along with Syracuse and Noto are known as the Baroque Triangle because of the abundance of baroque style buildings. In the late 17th century there was a large earthquake in southern Sicily. After the earthquake, most of the building had to be rebuilt and because baroque architecture was in vogue at this time all of the buildings were built in what is now known as Sicilian baroque style. Ragusa offers some beautiful vistas because it is built on several hills. I found this viewpoint and then went back the next morning to shoot the sun rising behind the city. It was such a beautiful sight to see. Wishing you the Best in 2017. I hope our paths may cross! I will be featured artist at Parklane Gallery in March with a large display of my photography in the front of the gallery. The exhibit titled “Colors of Nature” will include both landscapes and closeup detail shots. 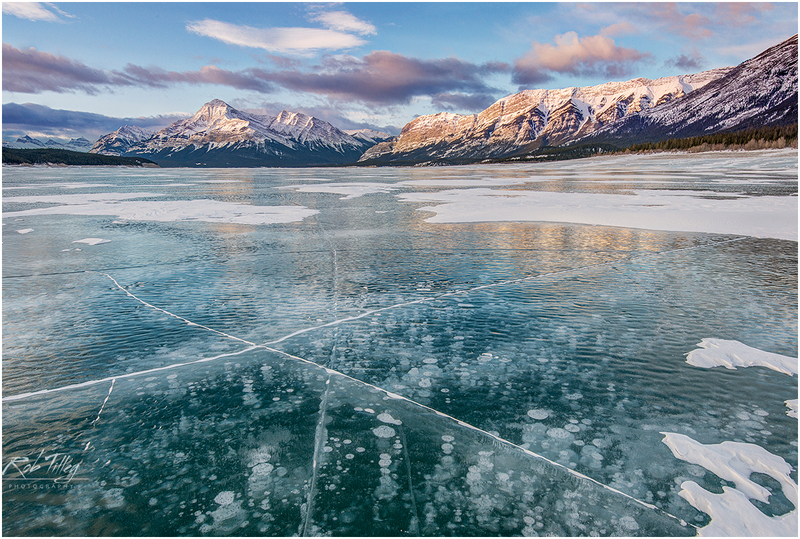 I have traveled near and far in my quest to capture the amazing colors, patterns and beauty of the natural world. All of the images in this exhibit will be photographs printed on aluminum. 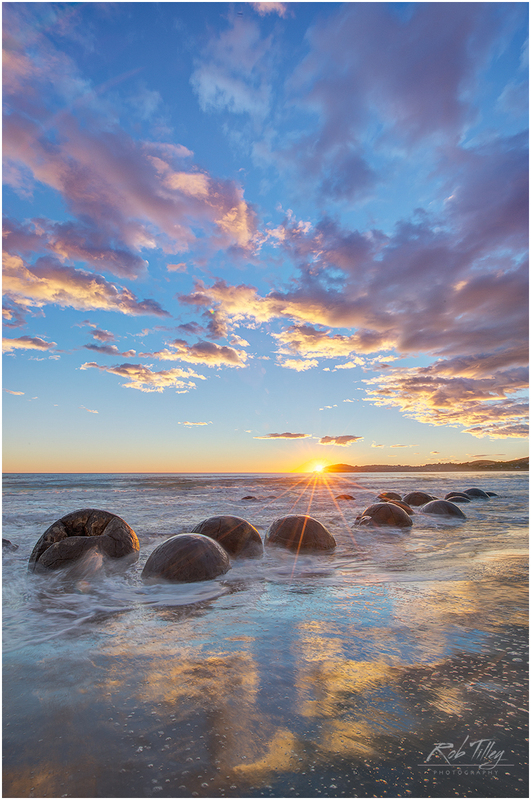 If you have not seen metal prints before, you will be amazed at their luminosity, clarity and almost 3 D appearance. You can see a preview of some of the images in the exhibit attached below. I hope you can join me for the opening reception on March 11, 5-8 PM. It has become a tradition for many photographers to publish their favorite photos of the year. I embrace this tradition because it helps me review my photography for the year and also is a good way to introduce new images to my followers. I have included some background information for each image below as well as why it was chosen. These images are published in chronological order so the order in which they are published is not any indication of my preference for any particular image. I hope you enjoy viewing them as much as I enjoyed shooting them! The first trip I took in 2015 was to Yellowstone in February. I was traveling with my good friend Gary Hamburgh and we had a great trip. At lower elevations, there was not much snow, but it was a winter wonderland in the higher areas. This first image is perhaps the most iconic spot in the whole park, Lower Yellowstone Falls. While I never pass up the opportunity to shoot impressive landscapes, I also like to use different techniques to produce impressionistic images. While we were in Yellowstone, we stopped at a forest that had been burned in a forest fire. The burned trunks were very black and stood out against the white snow. So I decided to use intentional camera movement. For this image I used a long shutter speed and moved the camera up while the shutter was open. This produced the abstract feeling of the image below. I also like to shoot close up shots of details which can also produce an abstract feeling. I was walking along the boardwalk near Old Faithful which has many hot springs and geysers where I found this scene. This image is frozen geothermal runoff from the nearby geothermal features. I like the colors and lines of this composition which I call Earth Tones. We took a photo tour while we were in Yellowstone on one of their snow coaches. Our guide was familiar with the wildlife and in communication with some other tour leaders. One of the other tour leaders said that they spotted a bobcat near the Madison River and when we got there we found the bobcat stalking a muskrat. I decided to use a pan blur to capture the bobcat as it leaped into the river. This technique kept the bobcat relatively sharp, but blured the background as the camera moved with the bobcat. I like the sense of motion in this image. In February we visited Mexico and for the first time Oaxaca which is known for its indigenous culture. One evening we attended a demonstration of Mexican folk dancing at a local hotel. I was fascinated by the colorful costumes and energetic dancing so I decided to use motion blur. 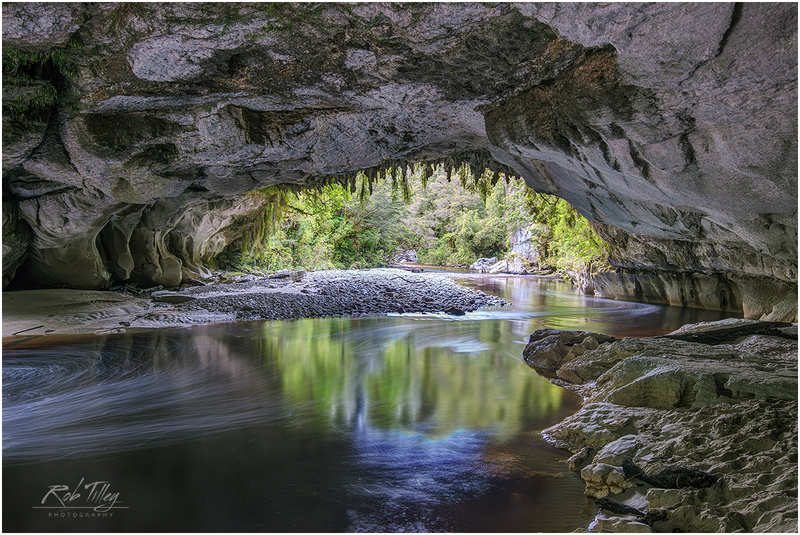 For this shot I used a long shutter speed and mounted my camera on a sturdy tripod. This technique caused the dancers to blur while keeping some parts of the image sharp. I like the sense of motion and vibrant colors in this image. In March we visited Kauai for the first time in many years. One morning I got up early and hiked out to Mokolea Point with a photographer friend in the dark to shoot the dawn light. I was very pleased to find the crescent moon low in the horizon just as the dawn sky was beginning to light up. I like the simplicity of this image with the crescent moon above the ocean and this ancient lava field. In late May we traveled to Portugal for the first time. We started in Lisbon and slowly worked our way up to Porto and the Douro Valley. When we were in Porto I found a great spot to shoot the Douro River at sunset. I like the illuminated buildings of the waterfront against the beautiful sunset sky in this image. After Porto we spent several days in the Douro Valley. This area has been growing wine grapes since Roman times and the hillsides have that well tended look which comes from centuries of cultivation. It is the custom of the Portuguese to grow olive trees mixed between the vineyards which makes for some pleasing compositions. This shot is a typical scene of the Douro Valley. After touring Portugal we traveled up to Spain and visited Santiago de Compostela for the first time. 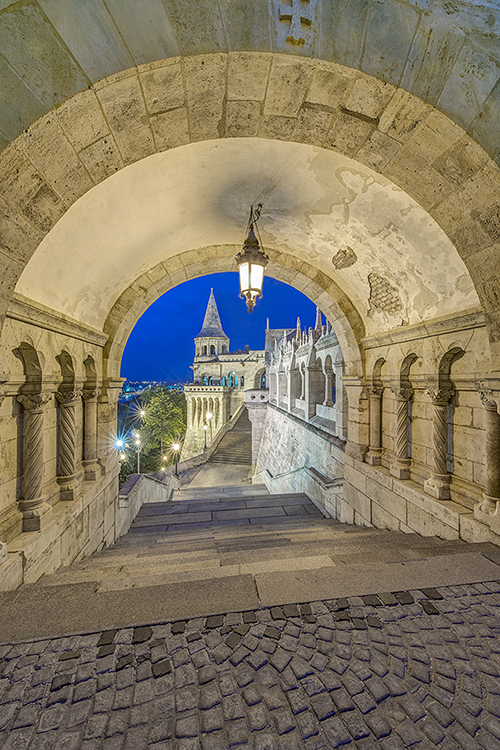 Because it is home to St. John’s grave, this town became famous as the destination of many pilgrims from all over Europe. Since it was such an important town for the Catholics, they built many monuments. The image below is in a former monastery which is now used as the Museum of the Galician People. I had never seen a triple spiral staircase before and I thought it looked best looking up towards the ceiling. Looking up is often an effective way to create an unusual point of view. In late September we visited Colorado to see the autumn color. Colorado has the best aspen trees of anywhere I have been and we were lucky to catch the autumn color near its peak. I found these aspen trees growing just outside the town of Aspen. I like these very tall trees with very white trunks and the yellow foliage in the background. When I was driving one of the back roads of Gunnison NF, I came across this aspen grove. The trees in the foreground had already lost most of their leaves so the early morning sun created very dramatic shadows on the road while the trees in the background still had most of their autumn color. I like this combination of dramatic shadows in the foreground with yellow foliage and blue sky in the background. On my last day in Colorado, it was rainy. It was not pouring, but a soft, gentle rain. I knew the conditions were not good for landscapes so I started looking for closeup shots. There were many water drops on the fallen leaves, but the way they had fallen was not particularly attractive. So I started moving the leaves I liked to a different location. It was very difficult to move the leaves without loosing the water drops and I was not always successful. But I was able to assemble a fairly large number of leaves with the water drops in tact and this image is the result of my efforts. I like the different colors in the image ranging from red to yellow and of course the water drops make it eye-catching. Wishing you the Best in 2016. I hope our paths may cross! The first trip I took in 2014 was to Hawaii in February. We visited Molokai and Oahu and this was my favorite shot. 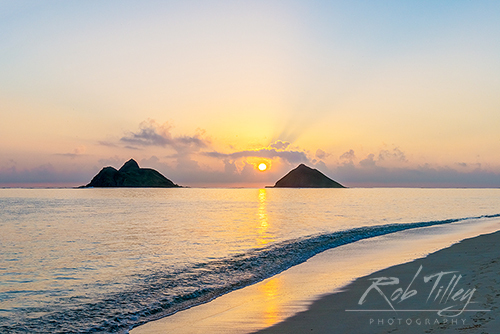 It was such a beautiful sight to see the sun rising between these 2 islets on Lanikai Beach on Oahu. In March we visited Mexico and my favorite place was Guanajuato. Whenever I am traveling I try to seek out unique architecture and make some images. This is Teatro Juarez, Guanajuato’s elegant old opera house. The opulent interior reflects the wealth which came from the nearby silver mines which at one time produced more than 70 percent of the world’s silver. Such a beautiful building! In April I flew into LA to attend a friend’s wedding and afterwards I drove up the coast to Big Sur. It was such a wonderful trip driving near the ocean. Just south of Big Sur I found these poppies blooming near the side of the road. 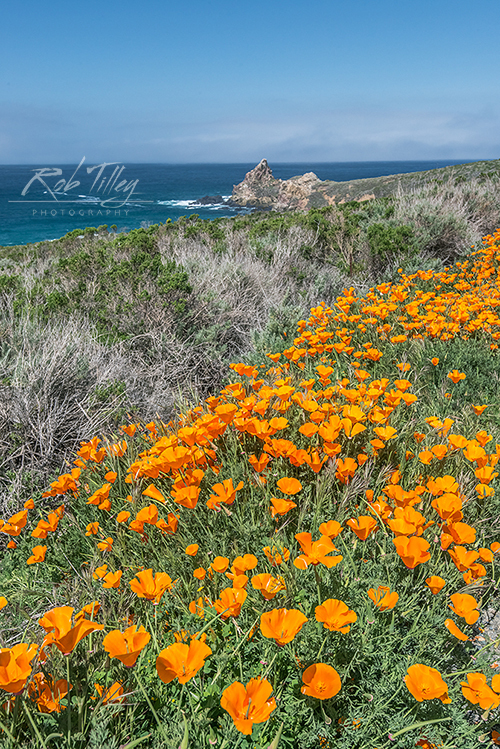 It was such a beautiful sight with the orange poppies in the foreground and the deep blue ocean in the background. Springtime on California’s central coast was fantastic! This is another image from my trip to California in April. I was driving up to Big Sur in the early AM and it was so foggy I could hardly see anything. So I decided to drive up to Paso Robles to see what I could find there. 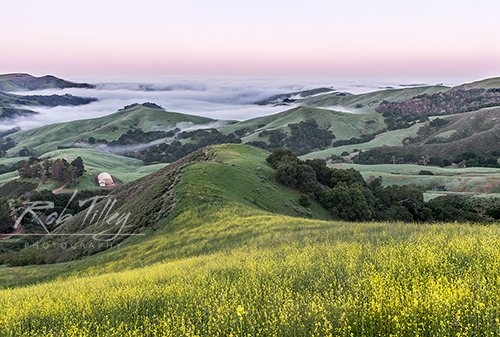 When I was able to get above the fog I found this hillside with wild mustard in full bloom. It was such a beautiful sight with the rolling hills leading your eye to the foggy coast and a pink dawn sky. I like the subtle colors in this image. 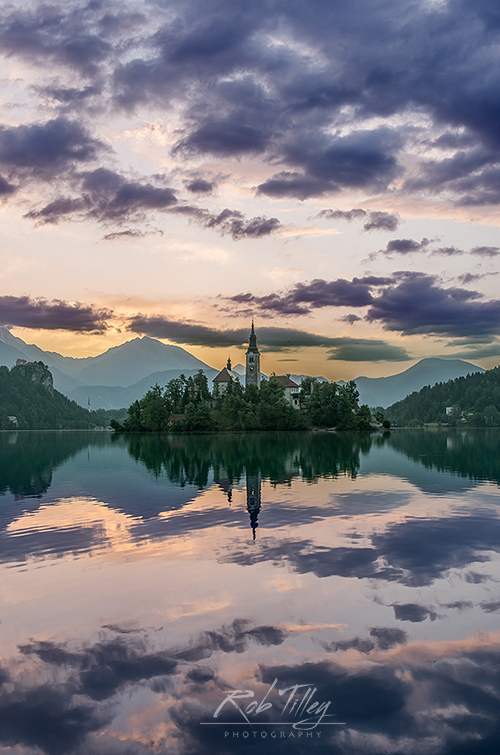 which has a small island with a medieval church in the middle of this beautiful alpine lake .It is such a picturesque spot and almost looks like a fairytale. I got up early to catch the dawn light and was lucky to have these beautiful clouds reflected in the still waters of the lake. What a wonderful way to start the day! In late May and early June, I toured Croatia after my trip to Slovenia. We ended our trip in Dubrovnik, the Pearl of the Adriatic, which did not fail to live up to its nickname. 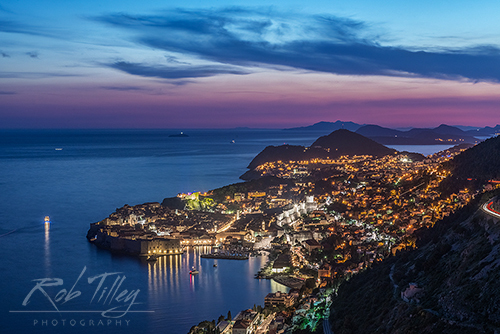 Dubrovnik is built on a peninsula that juts out into the Adriatic Sea. I wanted to make an image showing the city surrounded by the sea so I found a spot on a nearby hill with a great view and waited for the sun to go down. This is my favorite composition taken that evening. It was such a beautiful sight to see the city lights come on with the sunset sky in the background. In October, I visited Italy and my first stop was Rome. 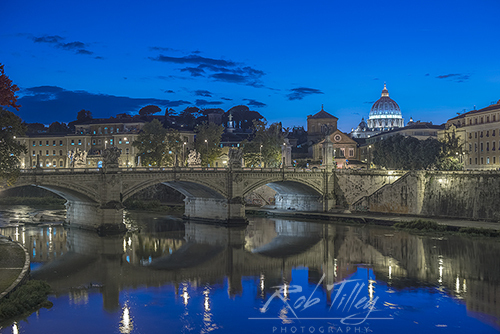 I was staying at a small hotel near St. Peter’s Basilica so it was just a short walk to the Tiber River. This is Ponte Vittorio Emanuele and the dome in the background is St. Peter’s. I like the deep blue twilight sky and the reflections in this image. Rome is such a beautiful city! 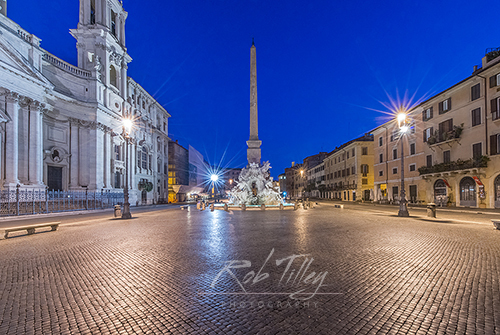 On my last day in Rome I got up early and went to Piazza Navona before sunrise. I like to shoot illuminated buildings during the blue hour and this was my favorite shot that morning. In the middle of the piazza is the Four Rivers Fountain which was designed by Bernini. Above the fountain is an Egyptian obelisk which was first brought to Rome when Egypt was a province of the Roman Empire. This square was first built as a racetrack during the reign of Emperor Domitian. I like seeing the piazza without any people which would be impossible during daylight hours. 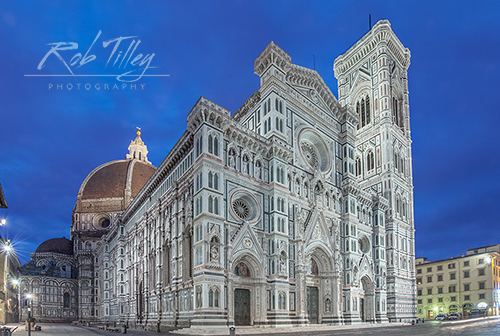 On my trip to Italy, we spent one night in Florence and I got up early to shoot the cathedral at dawn. The area around this beautiful old building is quite congested so I decided to shoot it from one corner. I like this beautiful illuminated building against the deep blue color of the sky in this shot. Over the past several years I have visited Italy many times, but I had not been to Cinque Terre so this year I decided to go there. Cinque Terre has many hiking trails which provide fantastic views of the towns. 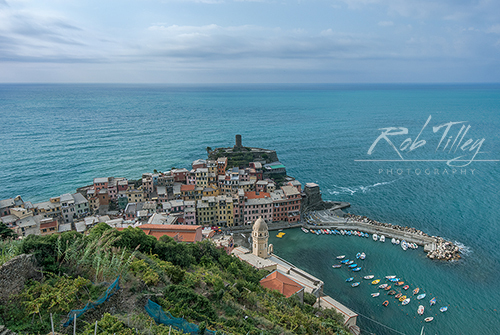 This is a view of Vernazza we found while we were hiking on one of these trails. I am always on the lookout for good view points looking down on famous spots so from that point of view Cinque Terre is a great place to photograph. 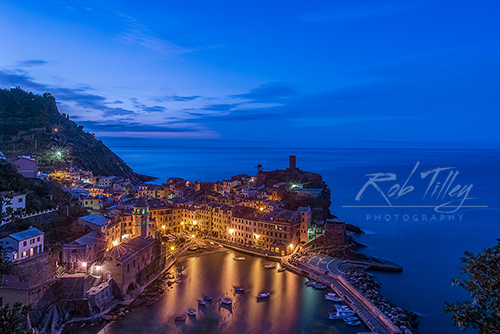 This is another shot of Vernazza. I got up early and walked out to a vantage point I had scouted out the previous day to shoot the town at dawn. I like the illuminated buildings against this colorful dawn sky. Cinque Terre is so photogenic. Now I understand why it is so popular with photographers. When we had some unusually clear weather in November I made a brief trip down to Portland, OR to shoot some cityscapes. 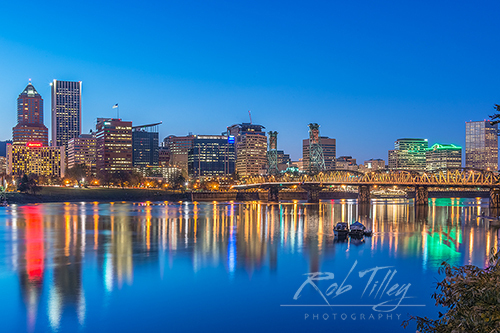 While I have visited Portland before I had not shot the skyline from the opposite side of the Willamette River. I found a great location near OMSI where I made this image. Luckily it was a calm evening and the reflections of the city lights in the river were fantastic. It was such a beautiful sight to see so many different colors reflected on the water’s surface! Wishing you the Best in 2015. I hope our paths may cross! The Trinity Parish Church Gallery on Pill Hill in Seattle is hosting an exhibit of my photography I will be exhibiting some new images from Seattle and my travels to Europe, Japan, and New Zealand as well as displaying older images. The new images will be displayed as metal prints. 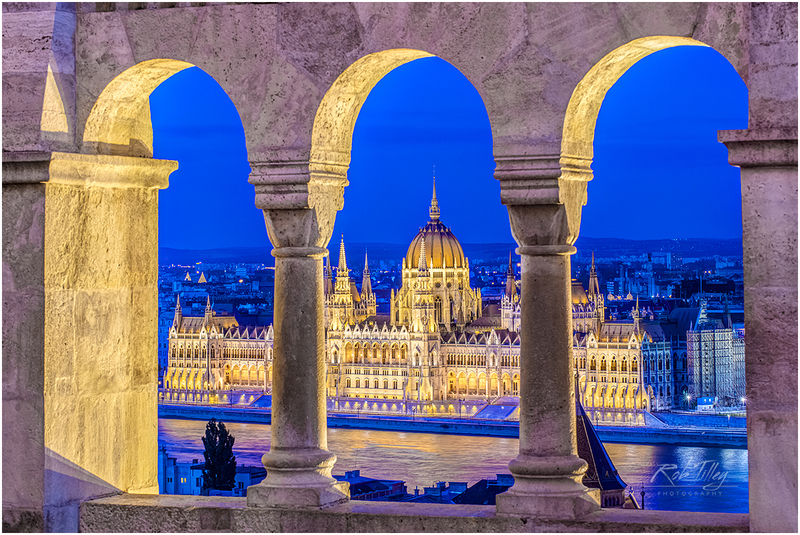 If you have not seen photographs printed on aluminum, you will be amazed at their luminescence. The gallery is open to the public every Sunday after church services and on week days by appointment. 2013 was a busy year with many interesting trips to such a variety of different locales. So it was a very difficult task to decide on only 10 favorite images. I feel truly blessed that I am able to travel widely to pursue my passion for photography. Hopefully that passion will be evident in the images below. 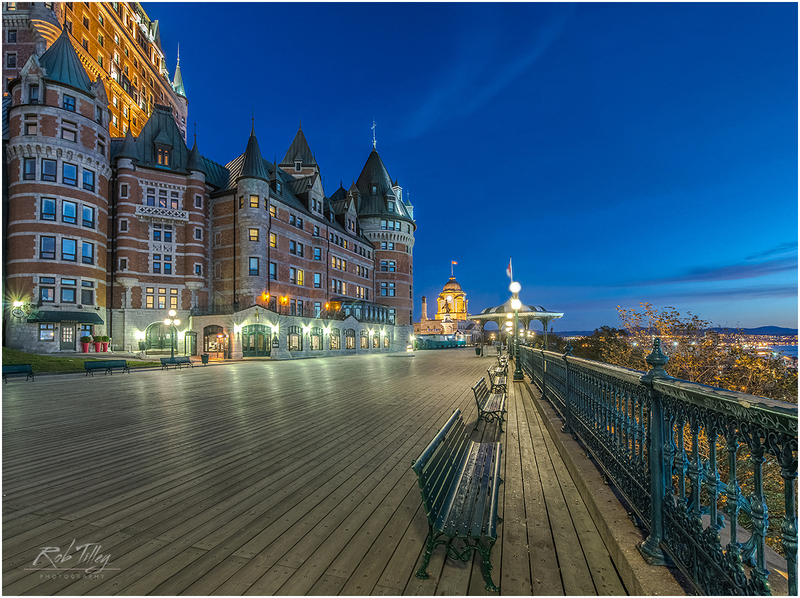 Some of the highlights of the year were trips to New Zealand, the Canadian Rockies, Central Europe and Quebec, all of which are represented in the images below with some local shots from Seattle thrown in as well. I also started to sell photographs printed on aluminumin in 2013 which have proven to be quite popular. 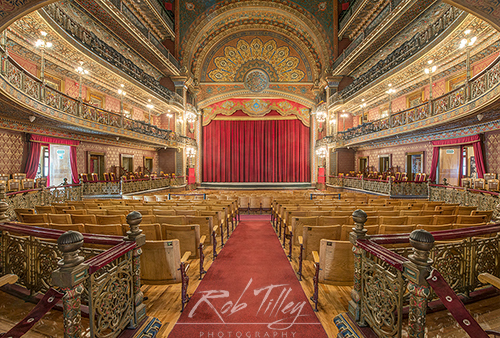 Metal prints have great luminosity and incredible detail and seem to fit my imagery well. Of course it goes without saying that all of the images below are available for purchase as metal prints. I plan to continue selling prints of my work at local galleries and art fairs in 2014. Opinions vary widely for artwork so I would be very interested to hear what you think about my images. If you have a favorite, please do include that in any comments you write below. I decided to publish these images in chronological order by the time they were taken throughout the year so the order does not imply any preference on my part for individual images. Wishing all of you a very Happy New Year and Happy Shooting in 2014!